It’s a common misconception that, in order to personalize learning, one must begin by planning individualized curriculum for every child, based on the individual child’s interests, affinities, and challenges. However, over the past few years it has become exceedingly clear that this is neither scalable or sustainable. The workload becomes untenable, and without intending to, this approach sets the stage for an environment that has children work in isolation, neglecting the importance of social learning. I’ve made this mistake before, too. I tried, in my first official year in a personalized learning school, to plan in this manner. I sent children activities that aligned with their respective levels of mastery, and I tried to create their own individual studies that aligned with their interests. But this workload quickly became unsustainable for me. It also wasn’t good for the children. As the educator, I became the sole curator of learning experiences, and in an environment where I wanted my children to own the learning process, it was critical that they had more of a role in telling the story of their own learning journey. For this reason, I suggest approaching personalization from a three-dimensional view. Not only will this make your workload, if you’re an educator, more sustainable and scalable, but it will also create the space for the children to be the drivers of their experience. Plain and simple, the most scalable way to approach personalization is by planning for the class from a whole-group perspective first. And in many situations, especially if you’re working in a public school where class sizes are large, looking at the whole-group first is usually the only route you have to go. Within the whole-group dimension, educators can create integrated units of instruction, ones with high-level essential questions that allow for an in-depth study of content, meanwhile allowing multiple entry points in inquiry-based, whole-group lessons, and perhaps even time for the children to integrate their own interests into the integrated unit. I based my unit planning off of Wiggins and McTighe’s Understanding by Design. You can see a sample of my interpretation of their work here. In the image above, you can see an example of my math message, the whole-group provocation that I use to help my children all converge in math each day. In this example, in particular, we looked for patterns in the number grid, helping to improve number sense and understanding of place value. This touched on several important Common Core Standards and also allowed us to capitalize on the social learning that so naturally occurs in a group. This provocation, in particular, has many entry points, allowing children to find very simple patterns, such as counting by tens, or more complex patterns, such as some of the diagonal arrows you see. Through a variety of methods, whether they be observation during these whole-group lessons or assessment using screener tools and standardized assessments, an educator can then use his or her knowledge of the children to begin creating small-groups for this second dimension of personalized learning. 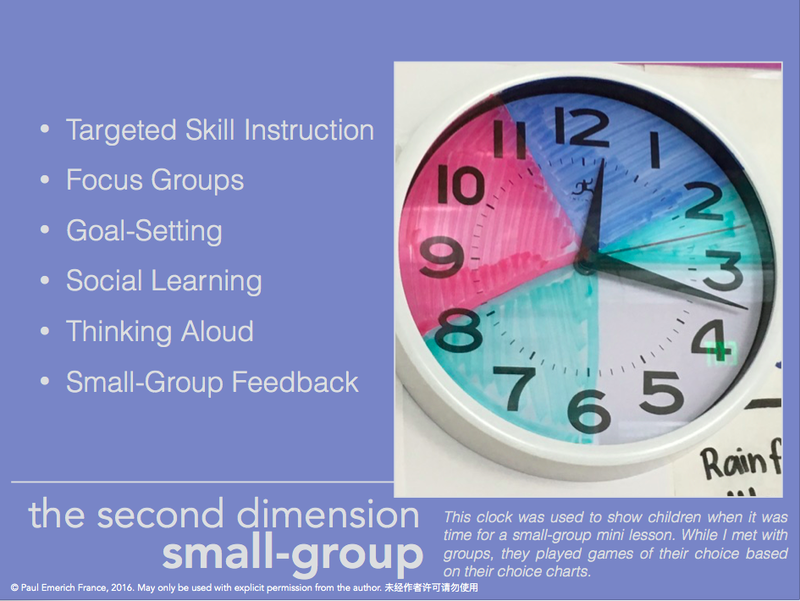 In these small groups, educators are able to provide more focused, targeted skill instruction. For example, in my classroom this past year, I used these small group times to provide group feedback around fact fluency, laying the foundations for multiplication and division, or even learning how to write numbers in the correct way. While I was working with these small groups on more focused skills and providing feedback both at the small-group and individual levels, the remainder of my children were working on their choice charts for the week or projects for the unit. 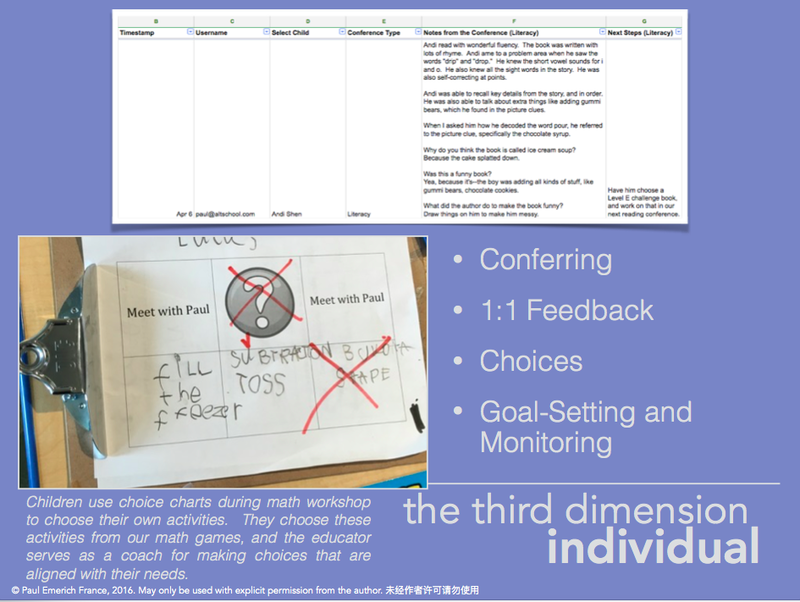 This tool, the choice chart, shed light into the third and final dimension of the personalized learning classroom, which is the individual level. Within this third and final dimension of personalized learning, we are able to achieve the ideal of personalization, in which every child is able to take control of their own learning, make choices for themselves, and get the focused feedback they need in order to grown at their own pace and in their own way. And while this does not mean that children are not getting feedback within the first two dimensions of personalization, recognizing this third dimension is critical because it is the place where we are able to monitor children’s individual goals, provide one-on-one conferencing, and help the child witness his or her own agency within the classroom. What’s more, it is within this final dimension of personalization that we are able to witness the power of technology: we are able to see that technology can actually help both children and educators manage the complexity of personalized learning through data aggregation, classification, and analysis. This may take the form of spreadsheets that house student data, or even tech tools that help children create their own personal portfolios, such as Seesaw or Google Drive. 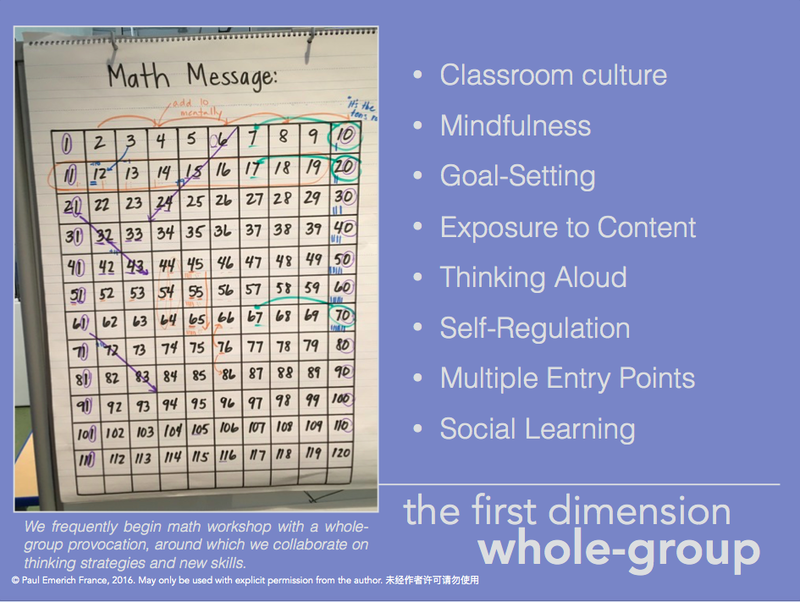 This multi-dimensional approach, while it can easily be accounted for when using the backward design approach to planning (Wiggins and McTighe), it can even be seen within daily lessons. As I shared in a previous post, I had a chance to implement this even with 45 students in Tsinghua University Primary School’s fourth-grade math class, where students interacted with a problem-solving task involving number patterns and geometry. Most importantly, this three-dimensional view of personalization allows educators to begin by planning for the whole class, gradually drilling down to the individual, in an effort to help all children find their place within the classroom community and class-wide curriculum. This way of conceptualizing the classroom is not only more sustainable for the educator in terms of planning and preparation, but it’s also more scalable in terms of training teachers system-wide on how to make the most of their planning time when creating a curriculum that is personalized for each individual within his or her class. Prev Personalizing Learning in China: How do you personalize learning for 45 children?